I was recently describing my process of scouting locations to one of my friends and their response made me think that it would be worth sharing here. My process is evolving but here is how I’m currently approaching things. Once I’d found a good location such as the one above I plugged the location into the photographers ephemeris an iPhone app. The app lets me work out the location of sunrise and sunset. I realize that I could probably use The Photographer’s Ephemeris to fill the same function as google maps, and I may well transition over at some point, but I feel like I have more screen real estate with google maps than I can have with The Photographer’s Ephemeris. 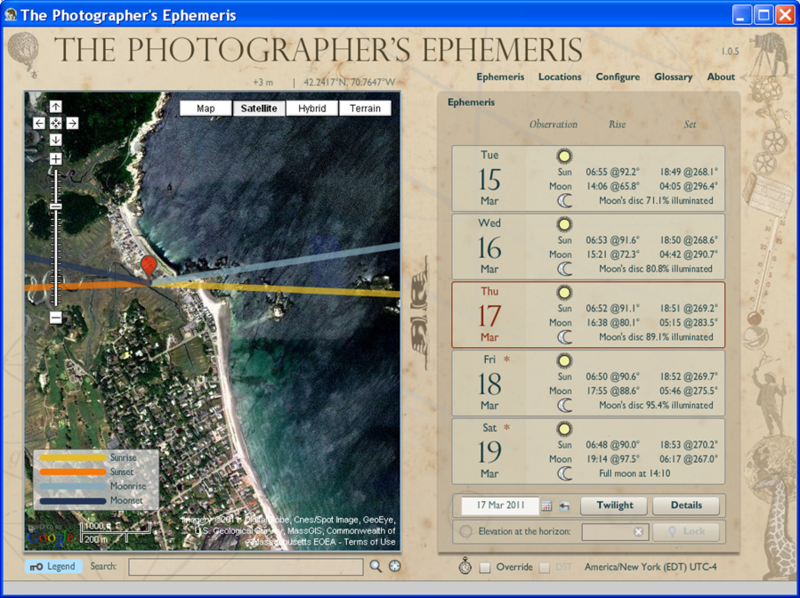 Here’s a screen shot to from the PC version of the Photographer’s Ephemeris that can be found here. 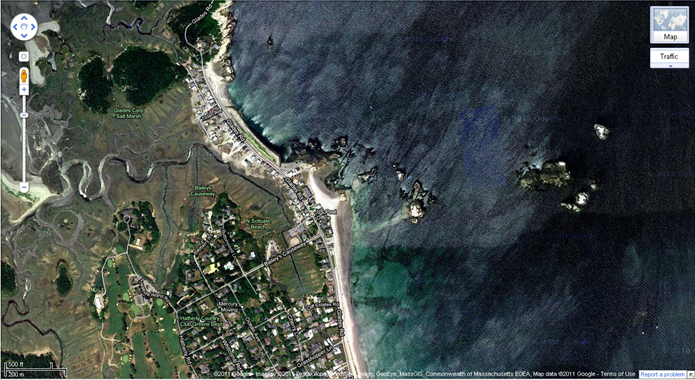 Since I’m dealing with the ocean I check on the tide table to see whether it will be high tide or low tide. There are lots of resources for this information. Because it’s handy I generally use the iPhone app Tides. There may be better applications for this available but this is easy and it works for me. Then finally I check the weather using either the 10 day or hourly forecast on the weather channel website. I’ve tried winging it many times and I’ve had spotty success. With the process described above I’ve had a little more consistent success. This entry was posted in Uncategorized and tagged Beach, Close to Home, Learning, Rocks, Sand Sea Sky, Scouting, Tools by nixonphoto. Bookmark the permalink.